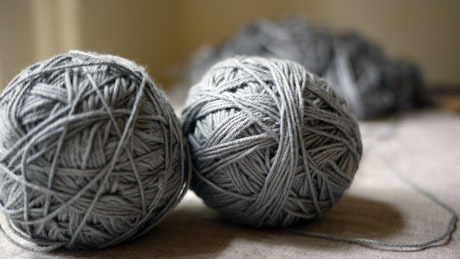 I rather like my story of how I came to be a knitter. My grandmother was a knitter, an amazing knitter, one of those old ladies that tuck’s one needle under her armpit and then just pumps out garments like a machine. Growing up we had beautifully knitted clothes all the time. Of course we hated them – maybe they didn’t have luxurious soft wool back in those days because I just remember everything being so itchy! So she started me (and my brothers!) off, she taught us a basic knit stich, the three of us would spend hours at her house just knitting little rows (we were very slow and there were many a slipped stitch, which my grandma would always fix). That’s about as far as I got with my knitting with nana, she used to cast on for me and as I child I never made it to the casting off bit haha! However, I still maintain that she sowed the seed (an extremely slow germinating seed!) for my future love of sewing! Years went by, my grandma sadly passed away and some years on I finished school and started a degree in Occupational Therapy (OT). No – contrary to many peoples beliefs I didn’t actually learn to knit (or basket weave for that matter) in my OT studies – although I do admit to being a total cliché of an OT (with my cooking, sewing, knitting etc…). I started learning to knit again from a number of my patients over years of clinical placements whilst studying. The first lesson learned was at an aged day care centre in Croydon where a little old lady taught me how to cast on (I was only there for a week so I didn’t actually get to the cast offing stage). My second lesson was at a residential rehabilitation centre in Shepparton where a patient taught me how to cast off (of course!) and my final lesson was at Sunshine Hospital in the Aged Mental Health Program where a little old lady taught me how to do a purl stitch. Of course now I learn new things all the time – mostly from the angels at Wondoflex yarn shop in Malvern, and of course the internet is an incredible resource too (I hope this blog will eventually contribute to that). However, I do really like my humble and romantic beginnings into the knitting world, and I like it here, so I think I’ll stay! I would love to know everyone else stories! Please comment and let me know what got you into your knitting or crocheting? Australian knitter Knitting beautiful things for beautiful people Say hello! I really enjoyed hearing your story. I wish my story was as sweet and fascinating but it’s kind of boring. Lol I started after 2 of my boys were diagnosed with Autism. I needed something to do while they were at OT, PT & Speech appointments or while we waited at many, many Dr appointments. I bought the book/needle kit from Walmart to “teach myself knitting”. That was about 10 years ago. I had actually only been able to make a few things that turned out quite wonky, but my little 2 lb chihuahua loved them as little blankets. Lol. When I got divorced about 6 years ago my knitting supplies got packed away and was not brought back out until about a year ago. Basically for the same reason; the boys were doing more therapies and I had to do something while I waited. I look forward to reading more of your adventures in knitting.